Kevin Frazell and his wife typically carpool from their home in downtown Minneapolis to their jobs on University Avenue in St. Paul. 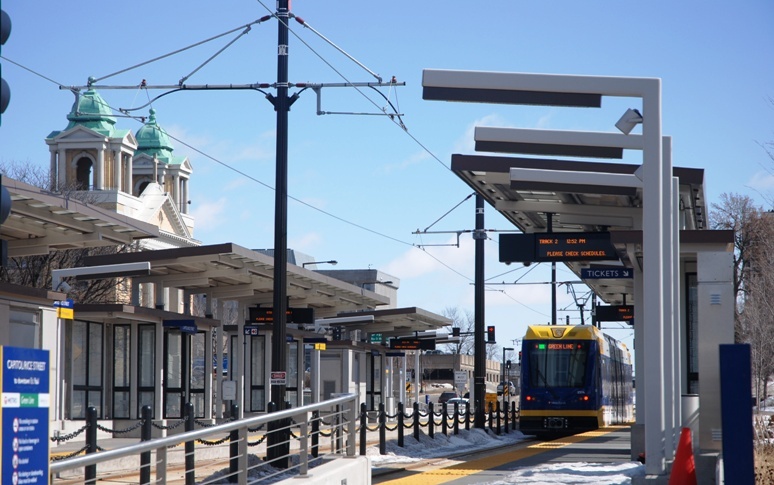 Beginning June 14, they’ll have another way to share the ride – the METRO Green Line. Frazell is one of more than 100 employees who work at the League of Minnesota Cities, which is located just north of the Green Line’s Capitol/Rice Street Station. His wife works near Hamline Avenue Station. The League’s offices are just one of the destinations near the Capitol/Rice Street Station, which sits at the intersection of University Avenue and Rice Street. 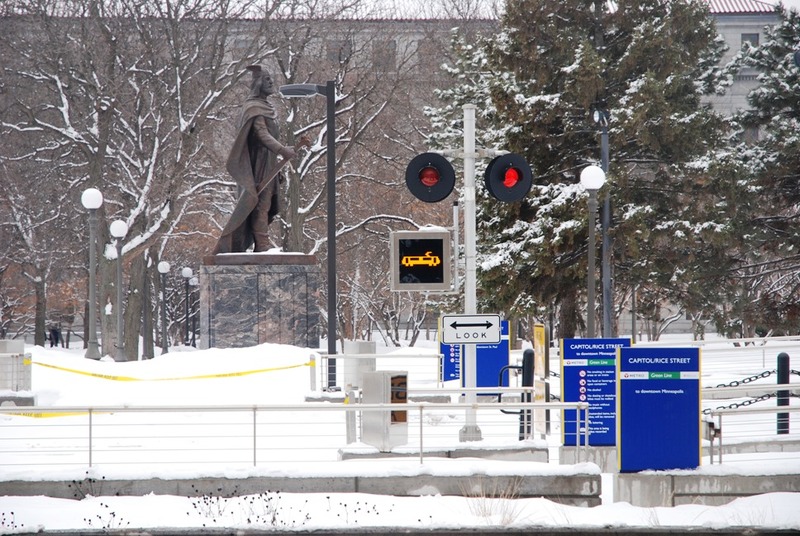 The Minnesota State Capitol is located just east of the station while the Western Sculpture Park and Minnesota History Center can be found a few blocks to the south. North of the station is the Rice Street business corridor, the Capitol Heights neighborhood overlooking St. Paul and the Oakland Cemetery, where some of St. Paul’s most prominent early leaders are laid to rest. Also north of the station is the state-owned Ford Building, where the Ford Motor Co. briefly produced cars in an unusual multi-level factory. Don Grundhauser has lived in Capitol Heights for nearly 50 years and is just two blocks from the new Green Line station. Grundhauser said he plans to use light rail to avoid parking hassles when going to Minneapolis for Twins games or shopping. Not everyone boarding the Green Line at the Capitol/Rice Street Station will be traveling all the way to Minneapolis, though. Employees at HealthEast will be able to use light rail to travel between several of the health care provider’s various St. Paul locations. Besides Bethesda Hospital, which is north of Capitol/Rice Station, HealthEast owns St. Joseph’s Hospital, near 10th Street Station, and has its headquarters at 1700 University Ave., near Snelling Avenue Station. It also recently opened the Midway Clinic, near Hamline Avenue Station. “Whether it’s for employees, patients or family members of patients, this is an option that we’re all very excited about,” said Jodi Ritacca, Senior Public Relations Specialist for HealthEast. Ritacca said the Capitol/Rice Street Station will be used by hundreds of employees who work at Bethesda and by visitors to the hospital, which specializes in long-term care. The most visible destination for the Capitol/Rice Station, though, is in the station’s namesake – the Minnesota State Capitol. St. Paul-based visual artist Seitu Jones used the Minnesota Bill of Rights translated into multiple languages. A poem written by John Minczeski is also featured in the station’s railings. 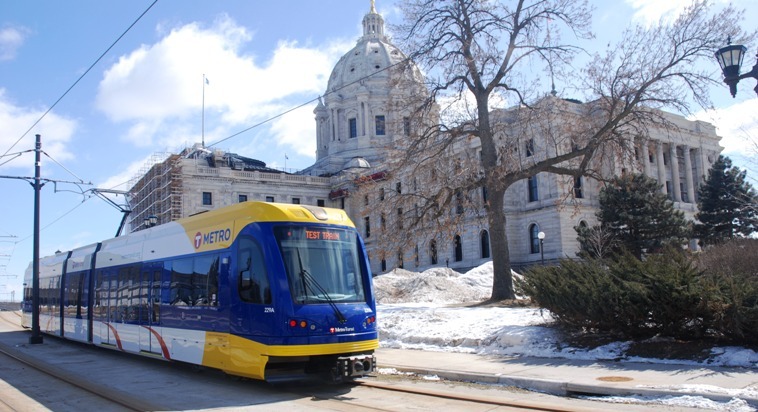 “Folks getting off at the station all need to be reminded of Minnesota’s organizing document and that we have a whole slew of rights guaranteed under the constitution,” Jones said. While much of the area around the station is owned by the state, additional development could replace large surface parking lots in the years to come. Plans to redevelop the Sears property south of University Avenue have been floated and the League of Minnesota Cities is in the early stages of planning mixed-use development on the land it owns surrounding its offices. Jim Miller, the League’s executive director, said he is “keenly interested in the impact the station will have” on land use in the area. Connecting bus routes: Route 3, with service between downtown Minneapolis and downtown St. Paul along Como Avenue and Rice Street; Route 16, with service every 20 minutes between downtown St. Paul and the University of Minnesota along University Avenue; Route 62, with service between Shoreview and St. Paul along Rice Street; Route 67, with service between downtown St. Paul and the METRO Blue Line’s Franklin Avenue Station along Minnehaha and Franklin avenues. Route 262, with service between Blaine and St. Paul along Rice Street. Public art: St. Paul artist Seitu Jones has created aluminum scrolls that will wrap light columns at the station and feature elements of the Minnesota Bill of Rights, such as the freedom of the press and right to own property. A poem written by John Minczeski is also featured in the station’s railings. Learn more. Area landmarks: Minnesota State Capitol, Western Sculpture Park, Minnesota History Center, Rice Street, Capitol Heights neighborhood, Oakland Cemetery. Bike-ped connections: East of the station, there are bike lanes on Park Street and John Ireland Boulevard. There are also bike lanes on Como Avenue, north of the station. This summer, St. Paul will construct a bike boulevard on Charles Avenue between North Aldine Street and Park Street. Nice Ride kiosks are also located nearby.